Five Kaua‘i golf courses have been named “Best of Hawaii” by Golf Advisor, the leading source of golf course ratings and reviews by golfers, for golfers. 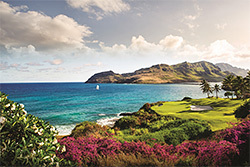 In a Top 20 listing of the best courses in Hawai‘i, Golf Advisor’s community of golfers voted Princeville Makai Golf Club No. 2, Poipu Bay Golf Course No. 7, Puakea Golf Course No. 13, The Ocean Course at Hokuala No. 17 (pictured), and Wailua Golf Course No. 19.